For many of us, ‘fat’ is a dirty word. We’re attracted to packaging that says ‘no fat’ or ‘low fat’ and we stay away from anything ‘high fat’; but did you know, there is such a thing as good fats and they’re actually healthy for you? At Becoming Healthy, we abide by 5 weight loss principles, number 3 being ‘use good fats’. But what exactly are good fats and how much of them should we consume? Read on to find out the answers - they might just be food for thought. Despite what we have all been lead to believe, not all fats are bad on the waistline. While dietary fats all contain 9 calories per gram, they can have very different effects on your health as well as your weight. Good fats are unsaturated fats that include polyunsaturated and monounsaturated fats. When eaten in moderation and in place of bad fats (i.e. saturated or trans fats) these good guys can actually play a huge role in helping you manage your mood, stay on top of your mental game, fight fatigue, and even control your weight or cholesterol. Good fats include foods such as nuts, avocados, olives, seeds such as sunflower seeds, fatty fishes, and flaxseeds. And that’s just a little of a long list. To see the full list of good fats head over to our weight loss principles page. “Bad” fats include fats such as trans fats and saturated fats. 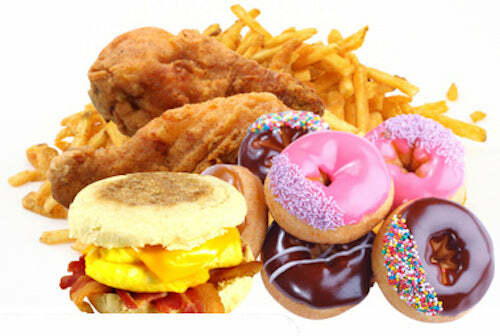 They’re guilty of the unhealthy things all fats have been blamed for, including weight gain and clogged arteries. Bad fats include anything processed such as commercially-baked goods, packaged snack foods e.g. chips and candy, fried foods, solid fats (such as margarine and vegetable shortening), as well as pre-mixed products e.g. cake mix, pancakes and chocolate milk. Foods that combine sugar and fats are a particularly bad combination. The first step is to become aware of what foods have bad fats and what foods have healthy fats. Anything with “partially hydrogenated” oil listed in the ingredients is terrible. Anything where you don’t have to read a label is most likely good (unless you're getting take away). Do your research and know what your good fats are and how much of them to consume (the baseline is usually 57 grams of good fat per day). When you know in detail what is bad and what’s good for you, you’re less likely to slip up. The second step? Remember, not all fats are bad, you can still have your cake and eat it too, you just have to replace your cake with almonds or avocados. Remove the bad temptations and give yourself a nourishing treat to start feeling better and being healthier. Was this article informative? What steps you planning to replace the bad fats with the good ones. We’d love to find out. Get in touch with Becoming Healthy for any further questions or to talk about your plans. Good luck!